This character called Homo naledi has been an annoyance from the get-go. Well, the annoyance has been from devotees in the Darwinian death cult who got all fired up and claimed that this was something to shove into the human lineage mythology. Hope we're finally done with this critter. Evolutionists were yee haw boy howdy about the finds and issued sensationalistic press releases — as usual. Something I counsel people who ask, "Evidence for evolution. This can be refuted, right?" is to settle down and wait a spell. 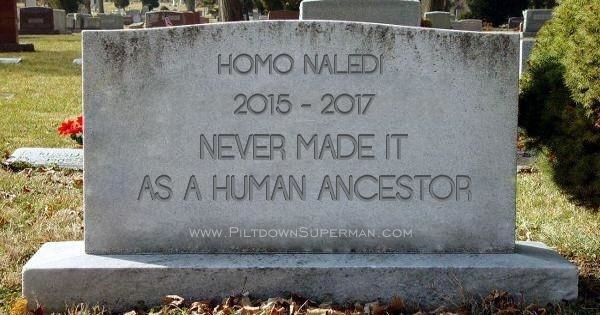 Likewise, creationists were also saying to wait, and the Institute for Creation Research had the zivilcourage to predict that H. naledi would be another evolutionary failure. They were right. The biggest problem for this alleged human ancestor is that the dates were wrong, even in evolutionary dating methods. In a welcome piece of honesty, the evolutionists overturned their own claims. They wouldn't be having these problems if they realized that particles-to-paleontologist evolution didn't happen, and the true record of origins is found in the creation account of Genesis. Homo naledi skyrocketed to international fame in 2015 as a claimed ape-like ancestor of man that fit the story of human evolution. Discoverer and promoter Lee Berger published hasty reports and then toured the world with dynamic, media-packed presentations. Back then, the Associated Press wrote that scientists had “discovered a new member of the human family tree” in the odd-looking fossil assembly. To continue reading the article that hopefully puts this thing to rest, click on "Another Evolutionary Ancestor Gets Nixed". Additionally, "Is Homo naledi a New Species of Human Ancestor?" Also, see "Homo naledi, a New Human Ancestor? ", which has some points of disagreement with the AiG article in the link immediately preceding which underscores the uncertainties in the discovery. Further, this next post links to a technical article: "More Confusion about H. Naledi".